You. Me. Ride This Crazy Train - Adventures and Observations on The GO: Part 2 of a new installment, exclusive to This Crazy Train, "Meet the Deckers"
Part 2 of a new installment, exclusive to This Crazy Train, "Meet the Deckers"
Hello CAA? Can you send a tow-truck please? I continue this series, Meet the Deckers, in which I review the double-decker (DD) buses in GO Transit’s fleet. In part one, we took our first look at the issues plaguing the shiny new Alexander Dennis Ltd. (ADL) DDs deployed on Route 12 between Niagara Falls and Burlington station. To recap, the Minister of Transportation unveiled these green gems with much pomp and circumstance on April 3 of this year. The media lapped it up and fast-tracked to print everything said by the minister and Metrolinx. Here’s an example, an article titled, New double decker GO buses 'better value for tax dollars'. On Thursday (2013/08/15) I was waiting for my St. Catharines Transit bus at Fairview Mall. The DD from Niagara Falls en route to Burlington arrived. The driver got out immediately and addressed the passengers who had queued to board; more riders than usual disembarked the bus. No one boarded the bus, which then drove off. This sequence of events was not the norm – time to investigate – queue the theme from Dragnet. I asked a group of passengers, who had waited to board the DD, what was wrong. They said they weren’t sure, but all riders in St. Catharines would be accommodated on a non-stop bus that was due to arrive shortly. I thanked them, and as I turned around, my eyes caught the sun’s rays reflecting off a puddle of pink fluid that hadn’t been there before. The problem was evident – yet another DD with a coolant leak. Yes, this type of failure has happened before with these new buses. Metrolinx loves to share their QUICKFACTS with us. In the one titled GO Green Initiatives, we are told that ADL Enviro 500 double-decker buses “have one of the most environmentally-friendly bus engines on the market”. Really? 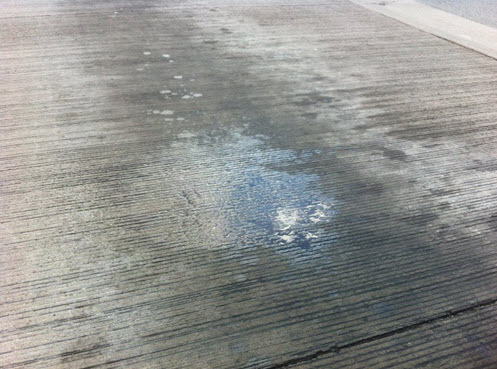 How does engine coolant benefit the environmentally-sensitive Golden Horseshoe Greenbelt? Is it possible to have the Ministry of the Environment follow these buses every kilometer of the way just to mop up the mess? 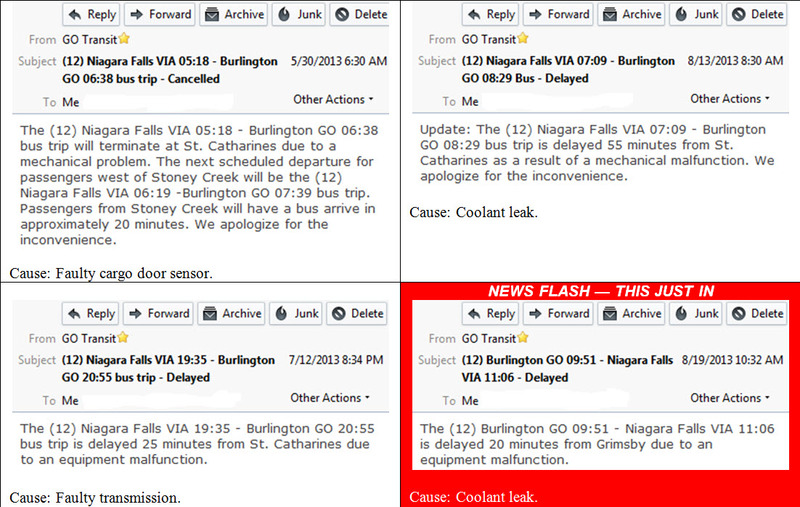 I subscribe to GO Transit e-mail alerts. The alerts that follow are but a sampling of the double-decker problems that have caused service interruptions on Route 12. By the way, there was no e-mail alert for the incident described herein. Is this just another “coincidence”? I’m becoming more suspicious. You may be wondering whether GO Transit’s Service Guarantee applies to these travel interruptions. Per the policy published here, the answer is NO! When travelling on the new $800,000+ double-decker buses, you lay down your cash (or tap on), and you roll the dice. Some of the new DDs fail repeatedly. The bus in this story is 8121, the very same bus that wreaked havoc on the afternoon of Friday, July 26. Not only are the manufacturer’s engineering standards and quality assurance procedures suspect, but so are the capabilities of GO Transit’s maintenance crews. Why are we seeing the same problem recurring in the field? Did head office not order the correct set of spanners to maintain the buses purchased from a company in Scotland? Making it easier to get to our destination? Seriously? Incidents with the double-decker buses take a toll on passengers and drivers alike. The stress I saw on the faces of all involved – especially the drivers – was quite evident. How is that a better quality of life? 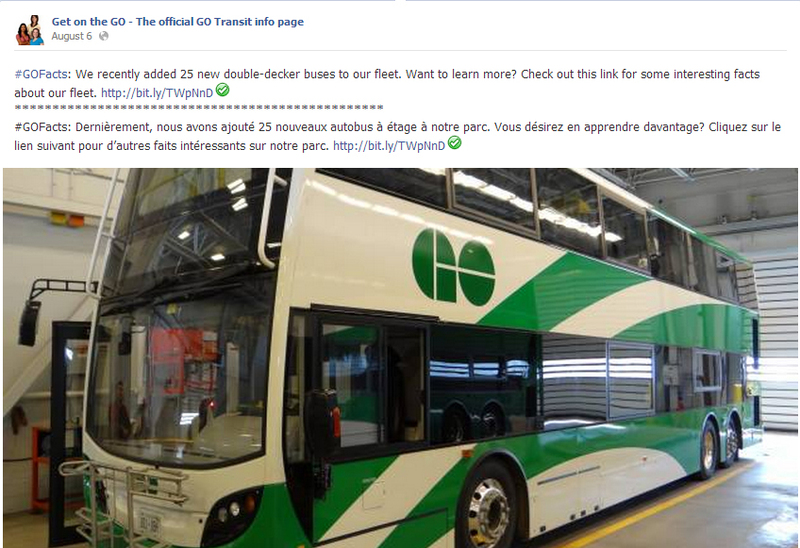 Are you still deciding whether GO Transit’s new double-decker buses are better value for your tax dollars? Stay tuned for more reports on these vehicles. Of course, the mass media are quite welcome to step up and share their own findings. Oh, I almost forgot. You’ll be happy to know the rescue bus (an older model MCI - thank goodness) did arrive in St. Catharines, picked up the waiting passengers, and delivered them to Burlington in time for their train connection. Three cheers for MCI and the bus driver! I have noticed that they are not always sending out notifications for train delays. Or if they are, it is after the fact (ie. the notification for the 5.10 will arrive in my email inbox at 6.30). I view this as a form of trickery or deceit. As that buses are not part of the service guarantee, why wouldn't they let people know? I figure it is so that people can't make alternate arrangements and they lose that potential fare. Why is Metrolinx not addressing these issues for the sake of passengers who have been inconvenienced. Man up, for God's sakes. This is ridiculous. And why did they buy foreign buses. Don't we make buses here in Canada/North America? "Did head office not order the correct set of spanners to maintain the buses?" GO doesn't buy any spanners. Maintainence staff have to buy their own. AFAIK nobody makes double-deckers in Canada. Megabus uses VanHool from Belgium and YRT/Viva had to go to VanHool for their first articulated buses because nobody made a comparable vehicle until NovaBus started building them. Not a week goes by on the Milton corridor that an MCI bus i ride has a failure where the driver during mid trip has to exit the bus and shut off the battery. It's like some magical trick they do.